Truth be told, we’re all a little nerdy, and it’s time to embrace it. Nerds are spectacular in that they’re unironically enthusiastic about all kinds of great things like academics, outer space, superheroes, classic literature, live-action role playing and science fiction movies. While the cool kids are busy trying to not care too much about anything at all, the nerds are coming out on top. How much do you let your inner-nerd show? I say it’s time we all show our interests loud and proud, no matter how geeky they may be. Let’s take a look at some quirky ways to display your hobbies and passions throughout your home. Bathrooms are a notoriously plain and boring part of a home – until now. With a little digging, you’ll find an unlimited number of fun things you can add to make your bathroom stand out. 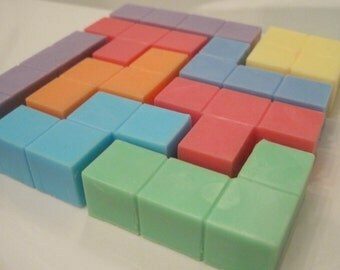 Being someone who has never excelled at any video game except for Tetris, I’m especially enthused by these custom Tetris-shaped bars of soap on ThisIsWhyImBroke.com. The pieces actually fit together so you can play a quick game in between washing, rinsing and repeating – talk about multitasking. If chemistry is your passion, these handmade periodic table hand towels should be yours. These fun cotton towels have a five-star rating on Etsy.com, with hundreds of positive reviews. You can customize your order by picking the colors you want, making them a personalized present for all of your mad scientist friends this holiday season. If chemistry isn’t your thing, but you’ve been hooked on watching rogue chemist Walter White for the last few years, these Breaking Bad bath salts are probably right up your alley. Last but not least, this Star Trek shower curtain and bath mat set on GeekDecor.net is a classic niche gift. I’ve seen quite a few fun shower curtains while browsing through these nerd-tastic websites, but this one takes the cake for all the diehard Trekkies out there. Make your time in your kitchen more fun with personalized accessories instead of your standard color-coordinated set. For instance, these Lord of the Rings salt and pepper shakers on ThisIsWhyImBroke.com are guaranteed to spice up meal time, pun intended. They’re great quality, affordable, and come in a variety of different styles. If you’ve avoided learning to use chopsticks and stick with using a fork for your Asian cuisine, that’s all about to change. These lightsaber chopsticks on GeekDecor.net are a great way to represent your inner-Jedi. They’re extremely detail oriented, with five styles and three colors to choose from. Potholders are a crucial addition to every kitchen – so why not pick up some adorably themed ones to use when you’re making dinner this Thanksgiving? Etsy.com has a few different deliciously nerdy options, featuring smart cookies, video game controllers and our favorite horror monsters. Your bedroom is your sanctuary, and it should be full of all the things you love. Luckily, there are endless opportunities online to make your room a true physical representation of who you are. For starters, you can show your love for the Mario Brothers with any one of these cushiony throw pillows on Etsy.com. After 50 years of different doctors, companions and storylines, one thing has stayed the same: the Tardis. If you’re one of the millions of Whovians, I don’t need to explain the significance of the Tardis to you. But I can urge you to spruce up your bedroom with a bedside Tardis lamp, or a convenient Tardis jewelry box, both brought to you by GeekDecor.net. Na na na na na na na na na na na na na na na na, BOOKSHELF! That joke was too lame, you say? Well I respectfully disagree; I’m free to geek out as much as I please in this post. This extravagant Batman bookshelf is a bit pricey, but only because it’s just so awesome. This sound, sturdy shelf depicting one of the most recognizable symbols in the world is a perfect way to make a statement, and the perfect place to store your favorite comic books and Batman DVDs. Amplify your family bonding time with these gadgets and gizmos for your living room. If you’ve ever been the victim of watching the same channel for weeks because you lost your remote, you’re not alone. This Harry Potter wand remote might be the end to your suffering, as it’s just way too cool to ever lose. You can program this wand to do different commands with different magical movements, finally bringing out your inner wizard you’ve always known was there. Did you honestly think I would forget about Pokémon? C’mon! This set of 8 hand-painted, wooden Pokeball knobs are an adorable accessory to the entertainment center and end tables in your living room. The best part? The screws and shipping are included in their very reasonable price. The holidays are fast approaching, giving you every excuse to treat yourself and your loved ones to any one (or two) of these nerdy home decorations. What nerdy touches do you have in your home? Share your ideas in a comment below! Great article! Thank you for including my site on your list. There are so many options for decorating your house to represent your own personal geeky style, so if you don’t see something you like listed here, check out some of the linked sites. I’m sure you’ll be able to find decor for all tastes and styles.